In a world where passwords are easily hacked and cloud storage services are targets, it’s difficult to feel as though your information is safe. Thankfully, good old fashion paper is still immune to data hacking from afar and from trailing by information thieves. But when it comes to destroying sensitive documents, it must be done right. Don’t assume that someone isn’t willing to go through your trash—instead maximize the security of your confidential files by using the professional, NAID certified records and document destruction service from Metropolitan Van & Storage, Inc. 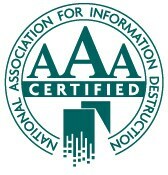 Since 1994, we’ve provided AAA Certified National Association for Information Destruction (NAID) approved document shredding and disposal services for government institutions, publicly traded companies and organizations in the private sector. We are the number one trusted facility to perform these confidential document destruction services affordably and professionally. At Metropolitan Van, our AAA Certified status comes with great responsibility and the highest standards that we proudly uphold. Our employees have all been trained as well as background checked and your documents are then recycled after complete destruction. Our facility has undergone unannounced auditing by NAID officials, rigorous testing, and intense training to be able to offer this ultimate security for confidential document destruction. If you’re in need of the most protected method in which to dispose of sensitive files, choose the AAA Certified services of Metropolitan Van and give you and your company the peace of mind.